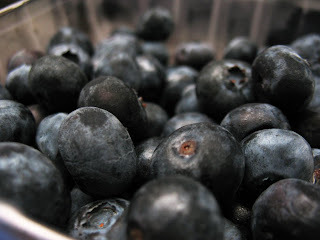 COOKING: Semi-fresh blueberries in January? Freezing fruit. We vacation in Michigan every year, and one of my favorite things to do is to buy fresh, farmstand fruit in Michigan and bake like a mad woman. This past year, I bought extra blueberries and tried my hand at freezing them to use later in the year. It was very easy. Here is how to do it below. This technique is perfect for fruit that is delicate and difficult to freeze, like many berries. 1: Rinse and pick through the fruit. 2: Lay on paper towels to drain and drip dry in one layer. 3: Lay them in one layer on a cookie sheet, and put in the freezer. If there are too many to put in one layer where the berries don't touch, use two sheets. 4: After one day, pour the berries in a freezer bag. Label and freeze the bag. 5: Berries are good for 6 months. Lay them on a cookie sheet to defrost at room temperature before using.